The impetus for this project began at the 2008 Roll of Renown concert in Tamworth when Nicki first asked Bob to sing a harmony duet with her, in tribute to Australian vocal group, The Singing Kettles. Soon afterwards they recorded that song, and another, just for fun. Encouraged by the results they worked on three more songs, with the thought that they might end up on one or other of their forthcoming solo albums. It was after that second session that the realization that something special was in the air; a unique blend of their voices combined with an affinity for a variety of music that had inspired their respective careers. A decision was made and after a short but intense burst of activity, the collaboration album was completed. The album was released to great demand in June 2009 at Canterbury Country, the Sydney show that Bob and Nicki co-host each month. As Nicki embarked on a five-week tour of the U.K. the following month with Bob on guitar, it was only natural that several of these songs would feature in the shows. The packed crowds, already enthralled by Nicki’s talent and warmth, received the songs enthusiastically, with The Price Of Love in particular becoming something of a show-stopper. NICKI GILLIS and BOB HOWE performing Wall of Death from their ‘collaboration’ album with Nicki’s U.K. 2009 touring band – Dave Clemo (bass) and Cozy Dixon (drums). Last night of the tour at Fort San Antone! Thanks to Tracy Dann for the videos. Mitch Hutchinson (acoustic guitar) Dave Clemo (bass) and Cozy Dixon (drums). At the Norfolk Country Music Festival. Bob witnessed the Richard and Linda Thompson Band in 1977 at Birmingham Town Hall and was an instant convert to their music. A song about fairgrounds and discontent, and possibly Bob’s favourite Richard Thompson song, but then there are so many. Nicki’s powerful vocal adds the perfect Celtic lilt to the understated melody. The contemporary power ballad by Snow Patrol, which leapt in to prominence as a series closer of the television show Grey’s Anatomy. Reinterpreted here as a duet with an acoustic slant and highlighting the delicate ambiguity of the lyric. Originally the B-side of the 1971 single Jeepster by T. Rex, a slice of mellow glam-rock. Duet inspiration derived from Anglophile U.S. band Southern Culture on the Skids. Written by Alton Delmore and recorded by The Delmore Brothers, the original brother country harmony act in 1933. Later performed by The Louvin Brothers and Tom Petty amongst others. 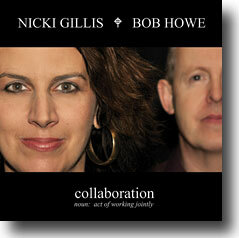 Nicki and Bob lay down an old-time acoustic groove on this track. A bona fide classic from the pen of the late John Martyn; a master poet and outstanding guitar stylist. Bob is a known Buddy Holly fan and Nicki adds the Linda Ronstadt influence. The combination of styles create a backdrop for Nicki’s exquisite vocal delivery. A song from the band Smokie suggested by Nicki’s husband Lee, and a favourite of all. Four-part harmony guitar…don’t try this at home! A classic ballad from rock band R.E.M. that showcases Nicki’s vocal with Bob taking the incidental vocal part and leading the musical crescendo. More sibling-inspired harmony, this time from the pen of the Everly Brothers and a nod to Bryan Ferry. 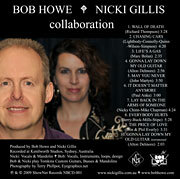 A reprise – this time to showcase Bob’s acoustic guitar and Nicki’s mandolin harmony. CLICK HERE to visit the on-line shop and buy COLLABORATION.